Gas prices are back in the news, simply because gas prices are rising. Reporters like to discuss WHY gas prices are rising, but who knows? The price of gasoline or crude oil can vary with any change, either in supply or demand. We can always point to shifts in demand (like the growing economies of China and India), and we can always point to shifts in supply (like the shutdown of production due to unrest in countries of the Middle East and North Africa). But it’s very difficult to sort out the net impact of each such factor, since the price is affected daily by so many different changes. Instead of trying to answer that question here and now, let’s take a step back and look at whether any of the current changes are really that unusual. Is the price of gas really high by historical standards? And how much of that gas price is driven by energy policy, taxes, and factors under the control of policymakers? In other words, let’s just look at the facts for now, and then try to analyze them later! Here are the facts, for the fifty years since 1960. The first figure below is from the U.S. Energy Information Administration (EIA). Look first at the BLUE line, where we see what you already know: the nominal price of gasoline has risen from $0.31/gallon to what’s now $3.56/gallon. It’s driving us broke, right? Well, not so fast. The RED line corrects for inflation, showing all years’ prices in 2011 dollars. So both series stand at $3.56/gallon in 2011, but the red line shows that the “real” (inflation-corrected) price of gasoline back in 1960 was $2.33/gallon. 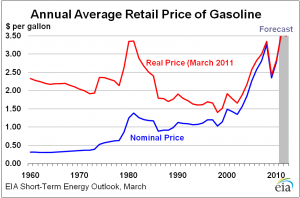 In fact, compare the red line from 1960 to 2009: over those fifty years, the real price of gasoline only changed from $2.33 to $2.42 per gallon – virtually no change in the real price at all! From 2009 to 2011 the real price increased beyond $2.42, rising to $3.56/gallon, but that may be temporary. You can see that the red line bounces around for the whole fifty year period. In 1980, the real price was $3.35/gallon, so the current price is not much different from previous upward blips in the real price of gas. 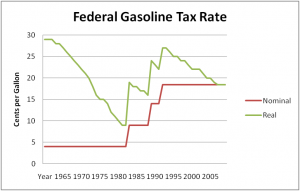 Now look at the U.S. Federal Gasoline Tax Rate, in the next figure. 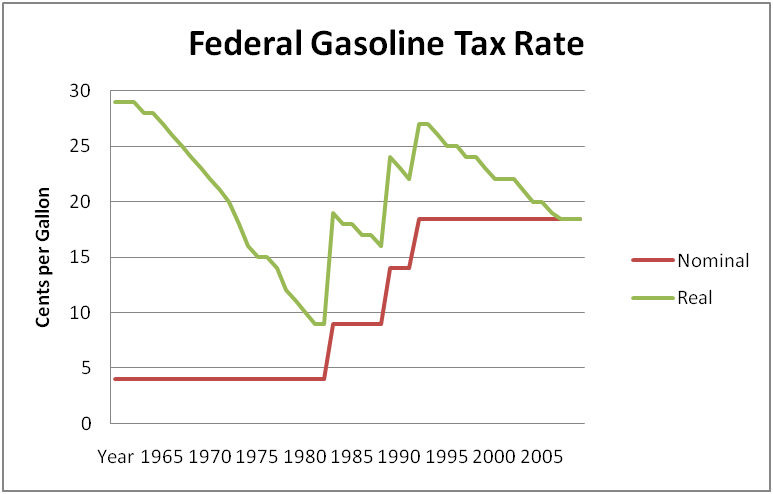 The red line in the next figure shows that the nominal statutory tax rate was four cents per gallon for years, and then it was increased in various increments to 18 cents per gallon today. But of course, inflation has changed the real value of that tax rate as well. 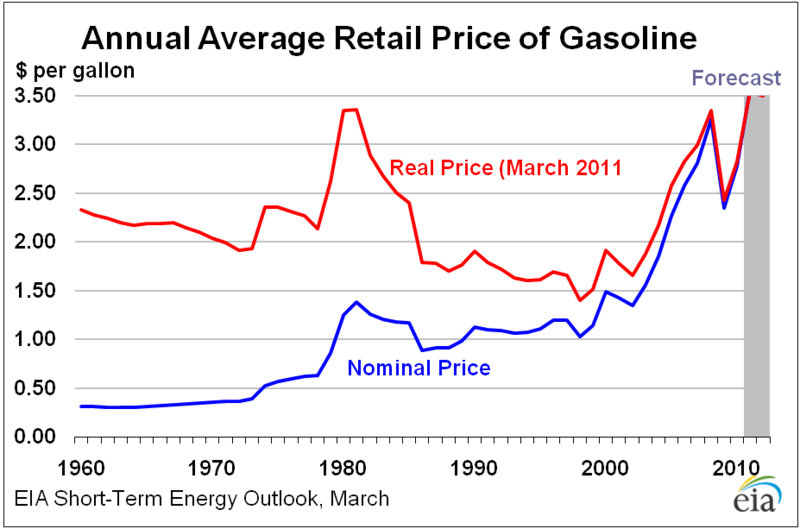 Using 2011 dollars again, both real and nominal tax rates are 18 cents per gallon today. But in 2011 dollars, the 4 cents per gallon back in 1960 was really equivalent to 29 cents today. In other words, the real gas tax in the green line has fallen from 29 cents per gallon fifty years ago to only 18 cents today. The gas price may be rising, but not due to any increase in the Federal gas tax. That Federal gas tax is falling in real terms. In the next entry, we’ll take a look at the various State gas tax rates, and we’ll look at how many of those taxes are fixed per gallon – so that they fall in real terms as inflation reduces the real value of those State tax rates. How Much Should Congress Leave to the Regulators? The very existence of the Environmental Protection Agency (EPA) has long been a point of contention between the two political parties. What is, and what ought to be the role of the EPA with regard to policy making? Congress cannot possibly enact laws that contain every detail about subsequent implementation, monitoring, and enforcement. And they should not put everything in the law anyway, in order to allow enough flexibility to deal with future contingencies. Besides, those in Congress don’t have the science background necessary to decide all of the details of some technological aspects of pollution prevention. The law does not say that every electric power plant must reduce emissions of each pollutant to no more than some number, like 37 micrograms per cubic meter. Instead, the law from Congress just says that EPA should protect human health to an adequate margin of safety. Yet some would prefer that the EPA disappear, along with every agency having any regulatory power. This agency, which was conceived in 1970 under Richard Nixon, has analyzed and supported some of the most important pieces of legislation of the last forty years, ranging from the Endangered Species Act to – more recently – the new emissions standards going into effect this year. In 2007, the United States Supreme Court ruled in a 5-4 decision called “Massachusetts vs. EPA”, that the EPA could in fact regulate greenhouse gases under the Clean Air Act, on the grounds that such emissions do affect human health. When combined with the new Republican-dominated Congress, we have set the stage for yet another ideological battle. Throughout the past decade, much of the discussion about controlling carbon dioxide emissions has largely centered around the idea of Cap and Trade. That system would effectively put a price on each unit of pollution emissions. It would create a market where the need for emissions and the cost of emissions are balanced in a way that can achieve economic efficiency. However, the most viable attempt at this in recent years, the Waxman-Markey bill of 2009 (H.R.5454), passed the House and not the Senate. It would not even get past the House in this term. The question then becomes, what exactly are the cards that the EPA retains in their deck? A recent article is titled “Greenhouse Gas Regulation Under the Clean Air Act” by researchers at Resources for the Future (RFF, by Burtraw, Fraas, and Richardson). It seeks to explore the options available to the EPA, in-depth. What they find is that the EPA can implement measures that will reduce greenhouse gas emissions significantly in a measured and cost-effective manner. For this to happen, however, they argue that the EPA must become bold and decisive in their actions. Bold action may be taken as an example of government overreach, and so the EPA must be careful. Republicans are currently in discussion to introduce the Energy Tax Prevention Act of 2011 . They recognize that the EPA holds some powerful cards after the Supreme Court ruling in 2007, and they want to take that power away. This Act would shift the EPA’s ability to regulate from the Agency to the legislative branch. Yet such an action could take any decision-making ability from the scientists and put it in the hands of the politicians. As EPA leader Lisa Jackson said, “Politicians overruling scientists on a scientific question – that would become part of this committee’s legacy.’” Herein lies a problem with democracy. The people in charge of making the decisions that affect us all, often have little knowledge of the actual issues at hand. After all, Republicans from oil-rich states like Oklahoma still claim global warming is nothing but a hoax. In my last blog, I pointed out the inherent nature of uncertainties in climate projections, and the long list of reasons for particular uncertainties about the effects of anthropogenic greenhouse gas emissions on the change in future temperature levels, droughts, severe storms, sea level rise, and about measures of economic damages from any such event. The range of possible outcomes is enormous, but I argued that the uncertainties are not a reason to wait and do more research before enacting legislation to reduce those emissions. Indeed, the huge range of probability outcomes is a big reason to act now to reduce the possibility of such costly events. Well, those approximately label his five reactions to uncertainty about climate change. First, one could DENY the uncertainty, which might be done to try to further some political agenda. Those who want environmental protection might say we KNOW that anthropogenic greenhouse gas emissions will cause significant global warming, and therefore we must act to prevent it. That’s just wrong; we don’t KNOW that global warming will be significant and highly costly. In fact, “uncertainty deniers” have done a great disservice to their own cause. The claim that global warming is certain just gives the other side the opportunity to point out correctly that it’s NOT certain! But that whole argument is irrelevant! 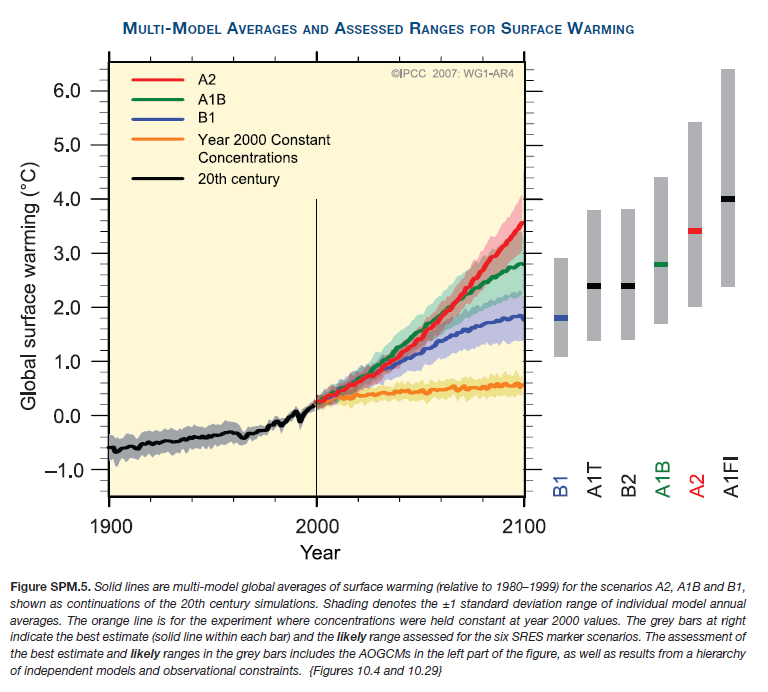 The relevant problem is that global warming MIGHT be significant and highly costly! Second, one could react by trying to REDUCE the uncertainty, such as through herculean research efforts to make better predictions. Research might well be worthwhile, and it might help reduce some of the uncertainties, but it will not reduce all of them, and it might introduce new uncertainties that we’ve not yet considered! Actually, Kloor’s fourth reaction sounds even more like bargaining, when he says “Uncertainty detectives – well all scientists should work hard to understand, represent, and reason about uncertainty (. . .). The conflict is when political opponents seize on this uncertainty as an excuse for inaction.” Now that is a cause for depression! Anyway, of course, the fifth and final reaction to uncertainty is ACCEPTANCE: “include uncertainty information in rational decision support systems and policies.” We need to know what is known, and what is unknown, to be able to make rational decisions as a society to adopt policies that can insure us against the worst possible outcomes. We at least need to make the right tradeoffs between the costs of that insurance and the benefits of reducing those risks. We need to undertake any available low cost measures to reduce fossil-fuel-fired electricity generation, to increase energy efficiency of vehicles and appliances, to increase alternative fuel use, to build water storage that can help deal with a possible increase in the number of droughts, and to build levees that can help deal with a possible increase in the number of severe storms. Accepting the fact of uncertainty means giving up the idea of building in those protections because we know things will get worse. Instead, it means building in those protections because things might get worse, and they might get a lot worse. You probably read about “Cape Wind”, a proposal to build 130 wind turbines off the coast of Massachusetts. They will be 440 feet tall, covering 24 square miles of Nantucket Sound, with a cost of more than $1 billion. Coal is cheap! Wind power is extremely expensive by comparison (and solar power is even MORE expensive). Maybe those renewable alternatives are worthwhile, and maybe they are not. But how can we ever tell, if policymakers keep trying to decide this issue for us?? Neither Barak Obama nor any other politician has the expertise to decide whether wind power is the right alternative, or something else. They just want to “do something” about global warming. Okay, fine, but the thing to “do” is to enact a carbon tax, or a permit price per ton of carbon dioxide emissions that reflects the true social cost of those carbon dioxide emissions. THEN if wind is cheaper, we’ll get wind power! And if wind power is still too expensive, then the true experts can get on with the business of finding what IS the cost-effective alternative to burning fossil fuel. So ALL the arguments both for and against wind power are a lot of wind. Any decision in the political arena will lead to excess costs. A carbon price will allow the experts and the market to decide. This week, I’ve been travelling in Paris, to make a presentation at an OECD meeting on “encouraging low-carbon vehicle technologies”. Now I’ve moved on to Barcelona, and in a few days fly to Istanbul. I’ve been sightseeing “old Europe”, with very narrow city streets that are really just alleys at best, where walkers share the space with intermittent bicycles and mopeds. The occasional delivery van is the only four wheeled vehicle that must venture down some of these alleys, just to reach the shops where they have to deliver their goods. It is all very quaint, and picturesque. Anybody who really needs to get somewhere just rides the metro. Perhaps the dense grid of subway stops is not surprising in a city the size of Paris, but Barcelona has a similar number of stops on many routes, all around the city. The population is about 3 million. I don’t think that any city of 3 million in the United States has dug so many subway lines for convenient public transportation. The narrow streets and convenient subways reflect the culture and history of the place. Given the topic of my presentation, however, I have to wonder if it reflects the current policies in place. Has the high tax on gasoline (“petrol”) encouraged these citizens to buy mopeds instead of cars, and to vote more funding for public transportation? Or has the number of mopeds and subways induced the people to vote for high taxes on petrol? I don’t know, and it would be very difficult to sort out the direction of causation. But I do know that “old” Europe is a long way ahead of the U.S. in terms of low carbon footprint. We in the U.S. see congested highways as an indication that we need to spend more money on highways! That kind of reaction will never get any of us out of our cars and into public transportation. For that we need infrastructure, which requires exactly the wording I used above: “culture and history”. It cannot be built overnight. The existing trajectory for building of highway infrastructure will put us on the path to future emissions, which sow the seeds of future global warming. I’m easily as patriotic as the next American. Last night I cheered when Bode Miller won the gold metal in the men’s “super combined event” at the Vancouver Olympics. But I really have to wonder if the rest of the world is right that the United States has already caused more than its share of what will be a huge global warming problem, and we’re just not doing enough about it. It’s not much warmer yet, but CO2 concentrations have already increased enough to guarantee another 5 degrees warmer climate. If we don’t change our culture of driving, our way of life could be history. Energy is an integral input to nearly all aspects of our economy. Energy policies, especially policies aimed at curbing greenhouse gas emissions associated with energy consumption, thus have sizable effects on nearly all participants in our economy. The distribution of these effects across participants is an important consideration of policy design. The incidence of the costs of energy or climate policy manifests itself in at least two major ways. First, policy affects the “uses side” of income, through product prices. A carbon tax may disproportionately increase the price of gasoline and electricity, two goods that represent a higher share of expenditure for poorer households. The uses side incidence is then regressive. Second, policy affects the “sources side” of income, through factor prices. A carbon tax may be more burdensome to capital-intensive industries and disproportionately reduce the return to capital. If so, and if capital provides a higher share of income for richer households, then the sources side incidence may be progressive. In a new working paper, however, Garth Heutel and I find that the sources side burden is regressive – just like the uses side. The reason is that high income households do not get more of their income from capital than from labor. The holding of wealth is not the same as the flow of income. The data for capital income indicate one major problem with using annual income to categorize families from rich to poor: the group with the lowest annual income has the highest fraction of income from capital. This group includes a lot of retired individuals who have no labor income and are living off their retirement savings. These individuals may not really be “poor” on a lifetime basis. In other words, we would like to classify households by the stock of lifetime wealth, but instead we are classifying them by a flow of annual income. If individuals smooth consumption over their lifetime, then total annual consumption might be a good proxy for lifetime income (or at least, a better proxy than annual income). So we also categorized all households in the Consumer Expenditure Survey by total annual expenditures (as a proxy for permanent income). Still, however, the group with the highest annual expenditure has a higher ratio of labor income to capital income than does the group with the lowest annual expenditure. Thus, the sources-side burden is also regressive. The carbon tax applies to the energy-intensive sector, which uses relatively more capital than labor in production. Thus it reduces the demand for capital, and it reduces the return to capital relative to the wage rate. This places less burden on those with more labor income – the high income group. The same occurs for annual consumption deciles instead of annual income deciles. Both the uses-side and sources-side incidences are regressive. When defined by annual consumption groups, however, the uses-side incidence is more regressive than when defined by annual income, and the sources-side incidence is less regressive than when defined by annual income. This topic could use more research. But this research so far is one indication that a cap-and-trade system or carbon tax might hurt low-income groups in two ways, instead of just one! So I’m particularly reluctant to write any blog about the poor state of the macro-economy, what should be done about it, and when we are likely to see any turnaround. But today’s article in the Washington Post is about macroeconomics and environmental policy! It is called “Obama laments job losses, announces tax credits for clean energy”. How are those connected to each other? Only through rhetoric. Basically, all of the points are valid, as presented by the article and even by the Obama Administration spokespersons. The economy is bad, and we don’t know when it will improve. We don’t even know what is the effect of last year’s stimulus bill, because we’ll never know what would have happened without the stimulus bill! And it’s also true that we might need more stimulus. And it is furthermore true (even if unrelated) that it might be a good idea to spend more money on green investments, to aid the transition away from burning fossil fuels that worsen global warming, and towards energy efficiency and alternative sources of energy such as solar power. Yet the Administration might as well link the two, at least to appear to be doing something, and to make headway on another important agenda item. Just as stated by Obama’s Chief of Staff, Rahm Emanuel, “You never want a serious crisis to go to waste — and what I mean by that is an opportunity to do things that you think you could not do before”. You can even listen to it on You-Tube, if you click here! Speaking of “unrelated”, I have another link to suggest. If you are interested in hearing about progress in Copenhagen toward international agreements on climate change, in the style of Dr. Seuss, click here!